Note to readers: I may or may not have straightened up before taking the picture on the right. Try not to judge me. Thank you. Some of the tubs are mailed to Brevig Mission from Anchorage full of groceries. Others come with us as checked baggage when we travel and return full of groceries. 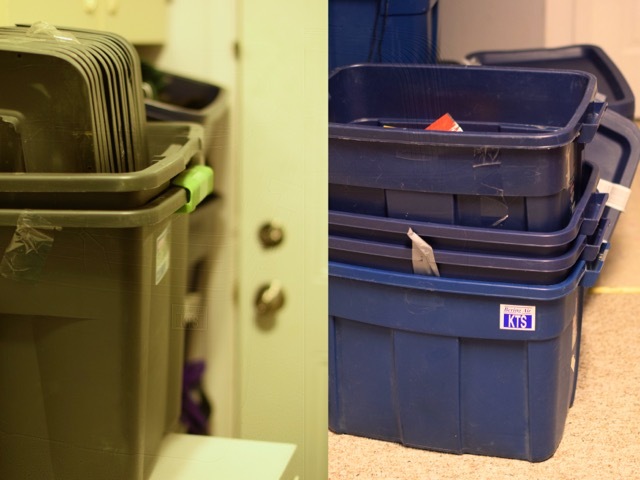 It may sound strange to use plastic tubs as luggage, but in Alaska it's completely normal. Alaska Airlines allows three free checked bags per person when flying within Alaska, and most people take full advantage of that. At the Nome airport I've seen everything from coolers to boxes of diapers come off the baggage carts. The agents don't bat an eye when we check in eight or more tubs in Anchorage. Now, if you're in the Lower 48, agents are less accustomed to the joys of traveling with plastic totes. You get weird looks, questions, and even doubts that you're allowed to use tubs as luggage. But you persevere. Because you're determined to have good things to eat without paying bush prices. The easiest way to secure the tubs while you travel is with duct tape or packing tape. Just make sure you wrap the packing tape all the way around and underneath the tubs. Chocolate chips, bacon, pub mix, and pepperoni sticks. Food of champions. 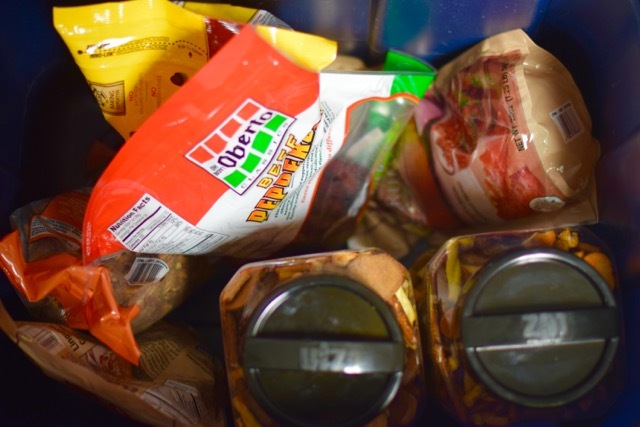 Note to readers: the above picture is missing approximately three thousand bags of fruit snacks that were tucked in between the other items. Our children had already removed the fruit snacks (and began consuming them as a frightening pace) before this picture was taken. Thank you. Additional additional note to readers: Steve went to Anchorage earlier this month and brought back lots of fresh things for me, including four blocks of goat cheese. I don't want anybody to think he's a complete dinkus in the food department. Or that he's an unthoughtful husband. Thank you. 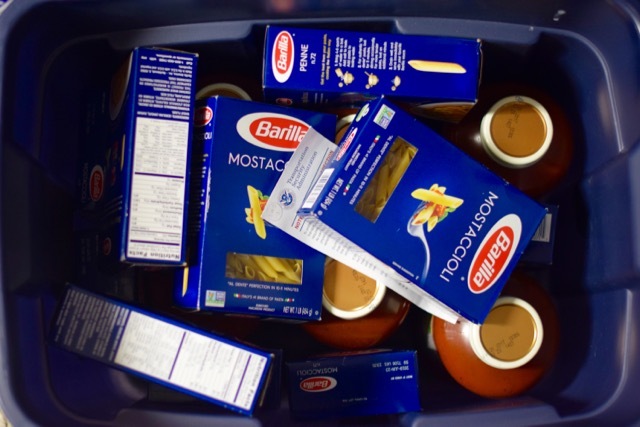 Another tub was filled with stuff for pasta. Yeah carbs! It's worth knowing that many hotels in Anchorage have freezers, so you can stock up on meat, chicken, etc. and freeze it in the tubs. The small airlines out of Nome also have freezers. Tell them your tubs are freeze, and they'll stick them in the freezer until it's time to load the plane. We've had great success bringing back steaks, pork chops, roasts, ground beef, chicken thighs, hot pockets (Steve), and all sorts of frozen goods. Stuff that needs to be refrigerated (like sour cream, milk, produce, etc.) are labeled "chill." Chilled stuff is generally fine by the time it reaches home. Just thinking of all of the yummy things that have been brought home in these tubs makes me happy. And makes me think I'll put up with the stacks of tubs in my house a little while longer.